Summary: This is a shorter walk than the usual of my walks in the Lake District walks and while it does not reach the lofty heights of the higher fells it still demands some effort; particularly on the climb from Stonethwaite Beck to White Crag which is a shaded climb through woodland. After the climb there is beautiful scenery around. 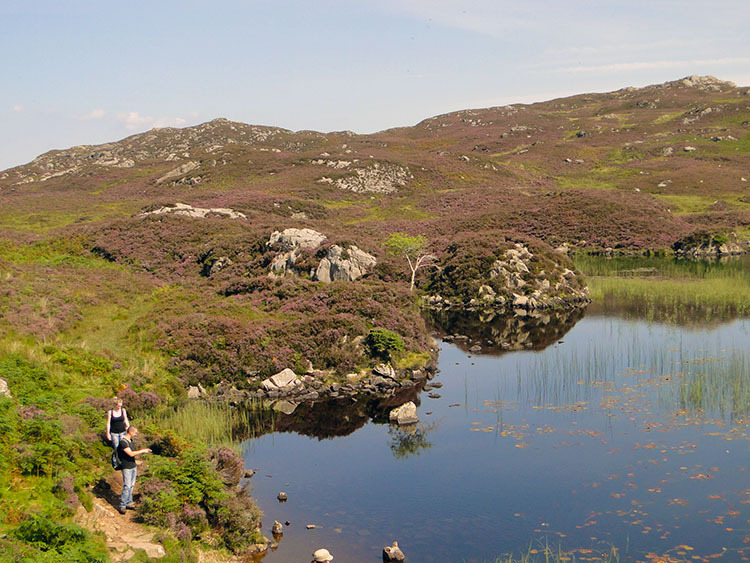 Dock Tarn is a delight and there are two Wainwright Fells (Great Crag and Grange Fell) to complete on the short round before returning to the start of the walk in the delightful village of Rosthwaite. As part of the Boys 2nd Annual Lake District Walking Adventure (August 2010) and after yesterday's Langdale Pikes epic we were all in need of a good walk but not such a monster. 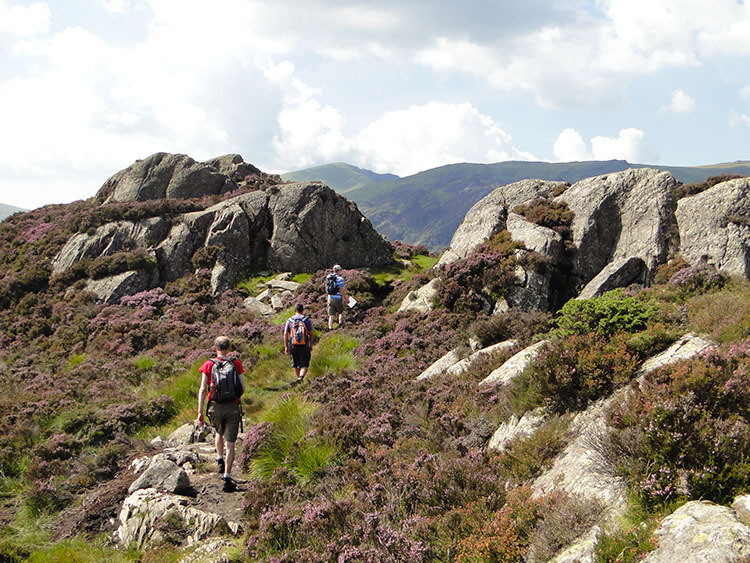 And as it was a Sunday we decided a nice climb to mid Lakeland heights followed by an upland exploration was just the ticket. 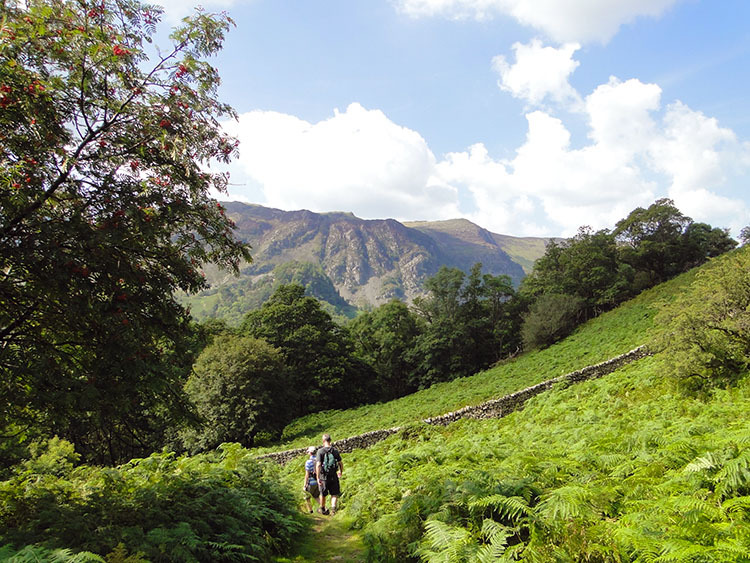 With two Wainwright Fells to visit during the round (and possibly a third with a detour to Castle Crag in our initial thoughts) the walk was planned and we arrived in Rosthwaite on a hot and balmy summer's day. We were pleased with the weather as we walked out of the car park and into the village for recent weeks had seen plenty of rain. It couldn't be better and despite heading the wrong way out of the village for 100 yards we turned back into the village and walked past bemused folk who had seen us going the other way moments previously in high spirits. 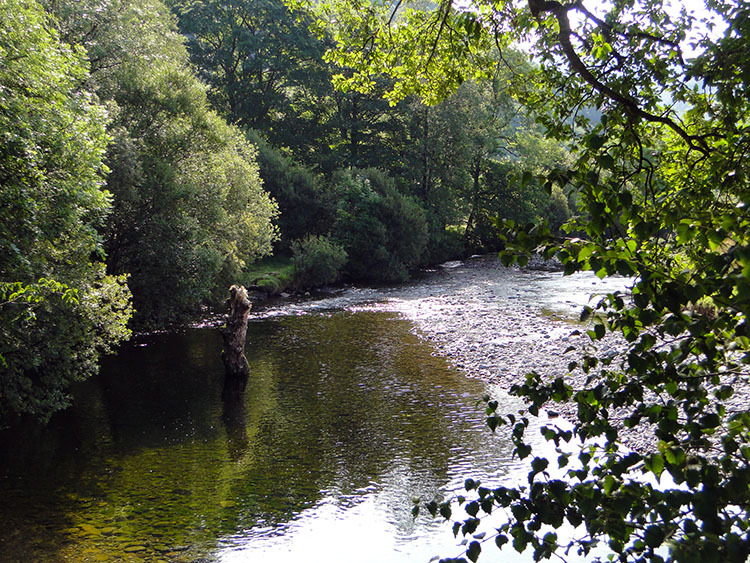 The sun was beating down so we appreciated the shade provided by riverside trees as we followed Stonethwaite Beck upstream for over a kilometer to Stonethwaite Bridge. 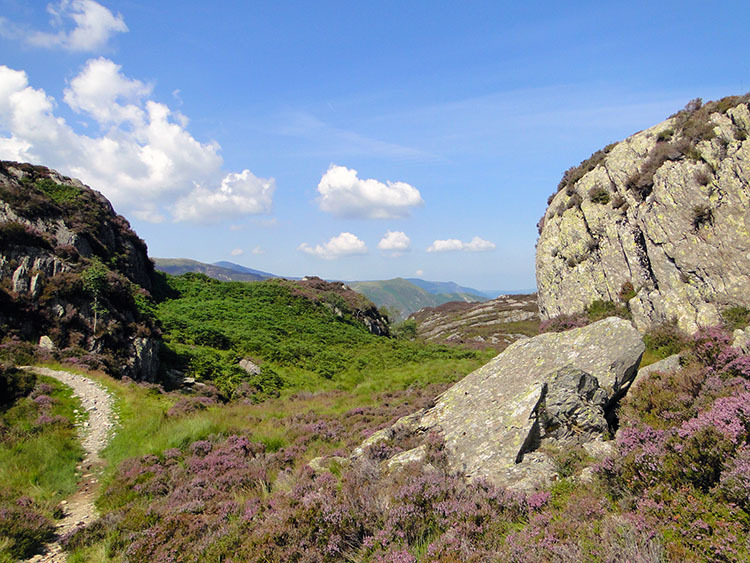 During the flat southerly walk I was often drawn to look at the distinct features of Eagle Crag beside the access track to Greenup Edge, a track I last took 11 years ago during my 1999 Coast to Coast adventure. 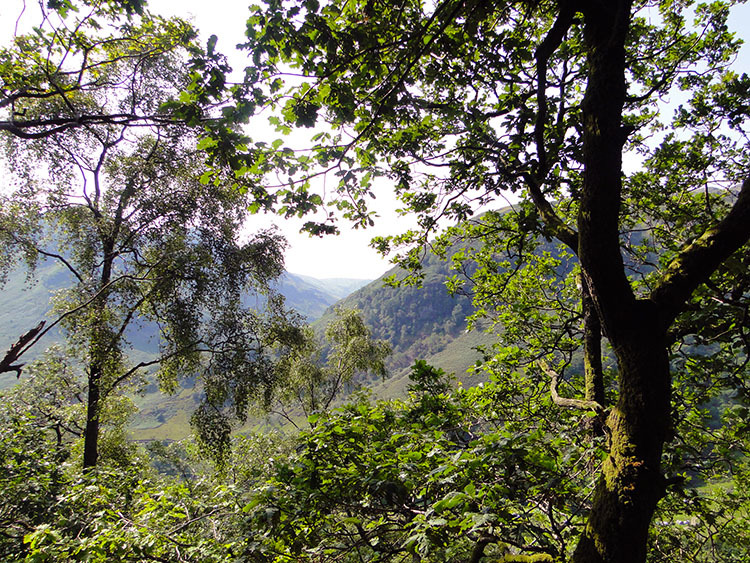 Soon after we left the level track to make our ascent to the fells above, a route through trees to Lingy End. We were all glad of the shade provided by the trees for it was a hot slog of a climb with 230 metres of ascent captured in just 550 metres distance, an over 40% incline which was like walking up a long flight of stairs. 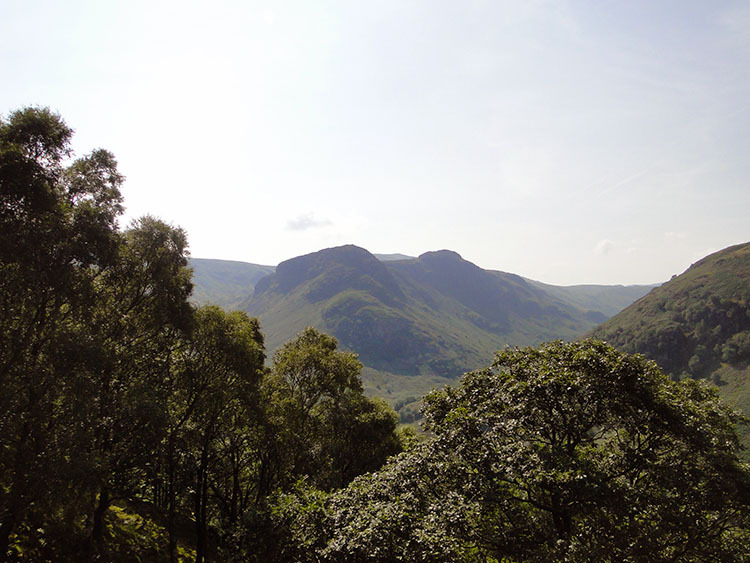 However the ascent was not without it's beauty with breaks in the trees providing super views towards Honister Hause and Fleetwith Pike, a hill that despite the quarrying is still a wonderful natural sight and one that would be surely scarred by the ill proposed aerial zip wire. Awful thoughts of the potential ravaging of Fleetwith Pike were soon dismissed though as we reverted to the continuing assault on the hill ahead and after some more strenuous effort we came out of the tree line and emerged at Lingy End. It was hot at Lingy End. 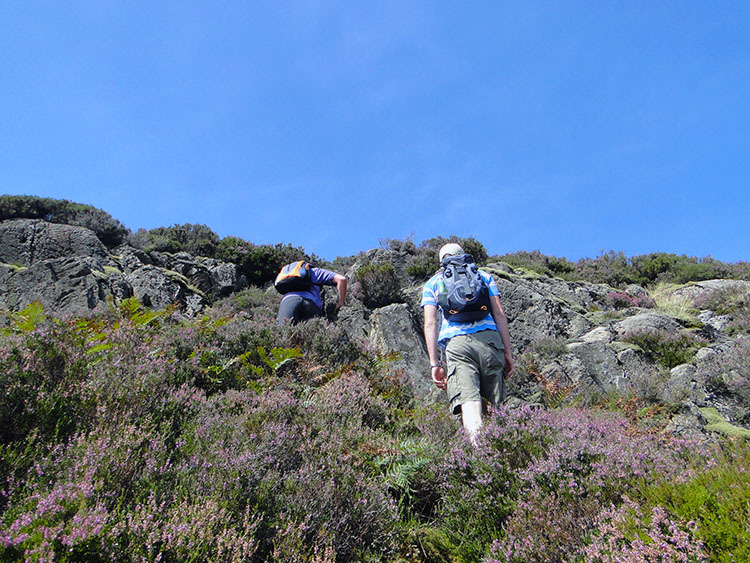 The next phase of the walk was a lovely quite level passage between the heather rich outcrops of White Crag and High Crag as we headed towards Green Combe. Soon we were walking alongside Willygrass Gill and while following it upstream Chris, Rick and Steve stepped on whereas Dave and I stopped to cool down in the refreshing waters. As we did so Chris beckoned us to him, as quietly as he could so as not to disturb something. Intrigued we made our way to him and watched a dragonfly laying eggs into the gill. It did so by making bounds up and down onto the water with it's tail, each time depositing a single egg into the water. I got the video camera out to capture the moment; it was brilliant. After the animal magic moment we strode on to delightful Dock Tarn. We reached Dock Tarn and decided it was a most appropriate place to take a break and enjoy an early Sunday lunch. Wainwright described Dock Tarn as"a jewel deserving a sweeter name" He was spot on and as we relaxed by the tarn side Chris commented on the fish in the water, it was plentiful with fry and young fish which he affirmed were young trout. Soon after a single duck landed and gracefully glided close past us without a hint of alarm. It was quiet and friendly at the tarn. That is until a group of young adults arrived with a couple of dogs which were unleashed. As they passed us one of the group threw a stick into the tarn which inspired both dogs to cool off and jump in. No harm in that, an acceptable diversion from the tranquility of the place but then they passed out of view and the recovered quiet was shocked by shouts of the group trying to recover one of the dogs which had spotted a Herdwick. Fair game to harass thought the dog and the result was the rest of the group castigating a junior female member for not controlling the dog. We had resumed our walk and left Dock Tarn walking past the group who were still arguing despite the dog being restrained and the clever sheep unbothered. After passing the undisciplined Steve and Dave made a course for north following the path while Chris, Rick and I cut off west to claim Great Crag. Steve and Dave couldn't fathom the fuss I was making about scaling Great Crag but I wanted to realise Wainwright's description "one of those modest fells which seldom seem to invite attention... there is no continuous path to the cairn, but it is fun to link the many intermittent tracks in the heather, and worth doing... This is a most delightful short climb, best done on a sunny day in August... On the right sort of day (warm sunshine) and at the right time of year (August) the top of Great Crag, carpeted with lovely heather is quite the right place to be" How's that, we did exactly as Wainwright recommended, Great Crag on a sunny day in August with lovely heather all around. Perfect! From Great Crag we recovered the main track and caught up with Steve and Dave at a point where a decision had to be made. The next destination was Brund Fell and rather than go down on the main track to Bowdergate Gill I led us over boggy terrain to Puddingstone Bank, a wetter but more direct route which retained our height. 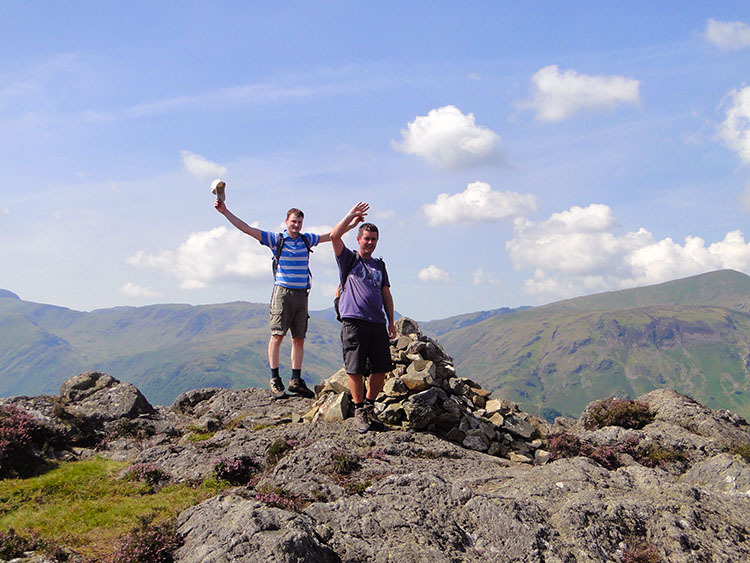 Then after the wet ground a series of rocky ledges naturally led us to Jopplety How and on to the summit of Brund Fell, an interesting many faceted rock tower which is the highest point on Grange Fell. Here we lunched for a second time and while doing so tried to help a family recover their errant grandfather who we had seen a few minutes earlier trying to locate the family! I am not sure they made a reunion on the fell top, they did not really seem that worried about Grandpa. For us, Brund Fell was it, we did not fancy Castle Crag on such a hot day and anyway we took the wrong path off the fell; the wrong one we had planned that is but the best one for us as it took us directly to Swanesty's How, Birkett's Leap, Resting Stone, Belt Knott and then Frith Wood before reaching the Borrowdale Road. 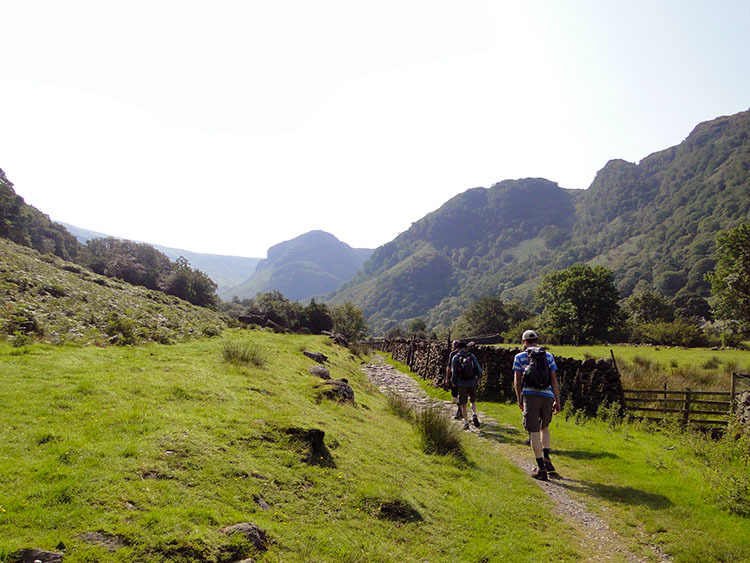 We were on the wrong side of the ascent to Castle Crag so I left that for another day. 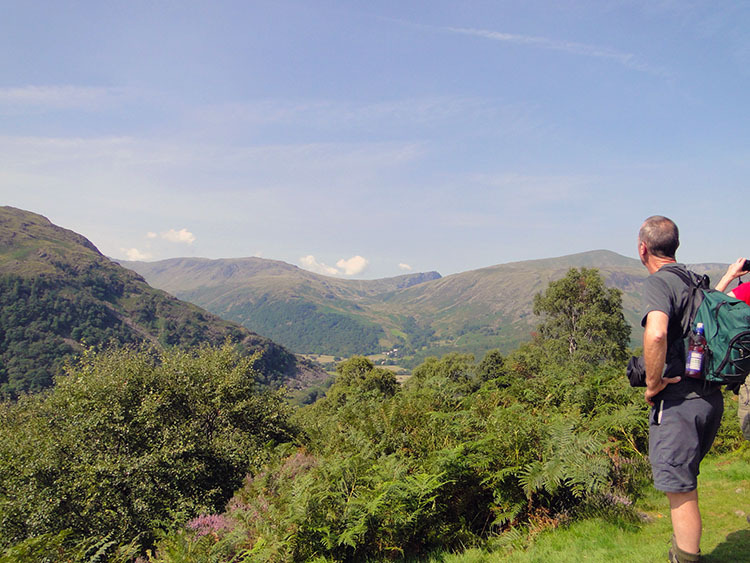 For us we followed the road back into Rosthwaite and after changing I drove us on a tour of Honister Pass and Newlands with the air conditioning on full. 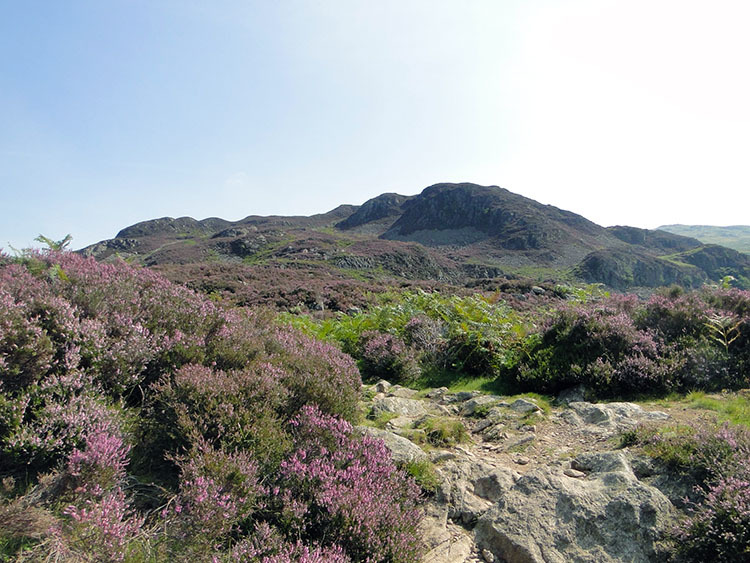 A great walk done in lovely Lakes scenery even including heather, a perfect Sunday one and apt for a day so blooming hot!